It is neccessary to bring the graphic film from which we can make the dies. For prices, please contact us by phone or e-mail. 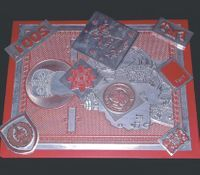 We own more then 200 foils for hot stamping. Different shades and glue formulations for all sorts of applications: paper, bond, pre-printed paper, laminated paper, artificial leather ... and much more.